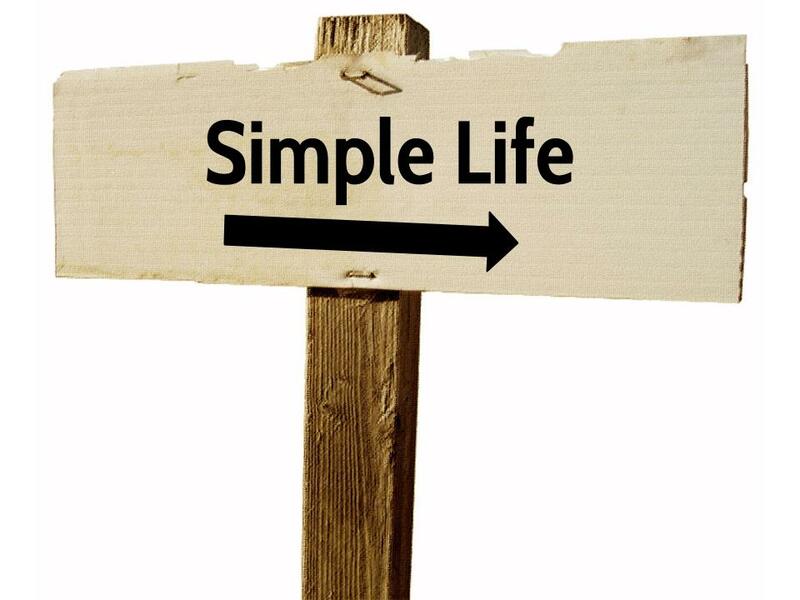 When you read the words “Simple Life” what comes to mind? Do you picture the pioneer life – a cabin in the woods with no running water or electricity? Sparse furniture made from surrounding trees? Eating foraged berries and mushrooms, or vegetables from your cultivated garden, or meat you hunted and cleaned yourself? Maybe simple means easier to you. Do you picture a contemporary, minimalistic home decorated in white and black with splashes of colour here and there? Electronic gadgets scattered around that bring ease of life? Possibly no car, no mortgage, no clutter of “stuff” to maintain? A simple life could be one that is intentionally free of busyness, excess, stress… free of MORE. It could mean LESS worry, exhaustion, and sickness in your days. Doesn’t that sound nice? I’ve been on a journey to simple for the last few years. I’ve read piles of books and followed scads of blogs and chatted with many people about the elusive idea of “simple”. Getting to simple means getting to the basics of life – all areas of life. It’s not so much what you remove from your life. What’s important is what you add, or what you keep in your life. There is some soul-searching to do, as well as a revisiting of the fundamentals. There are questions to ask yourself, most likely some twists and turns on the road ahead of you, and inevitably some obstacles to overcome. Simplification may be a leisurely saunter for you that takes years to achieve, or you may grasp tightly to it and run like crazy with it. You may find yourself paring back a little too far, and needing to add a few things back into your life to get the balance that fits for you. No two journeys will be the same and comparison will get us nowhere. Simplicity is a very personal choice. Every year, as January 1st approaches, I choose a word to focus on for the year. I pray about it first and reflect on what God might be leading me to focus on. What Bible verses seem to pop up repeatedly? What songs am I drawn to currently? What word or theme seems to resonate deeply with me just now? I ponder on these things and choose. For 2015 my word was Simple. Funny thing was I had wanted that word for 2014, but felt a different focus was required first. So for 2014 my word was Change. And not just change, but Crazy Change. My life had been spiraling and crazy kinds of changes were needed to find my balance. So I set to work, decluttering my life and my surroundings of all excess, hoping to get to the good stuff. I asked myself what was needed for a healthy life, family, and faith. What made me tick? What gifts and abilities did I have? Where did I find my purpose and my passion? There was much to sort through, and much change (of the crazy kind) required to get to simple. One of the hardest lessons was learning that most of the change would come from me – from within. After setting out trying to change everyone and everything around me in my quest for simplicity, I realized this was only bringing about more discontentment and judgement on my part. This led to strained relationships, more stress, and more exhaustion. I didn’t want MORE of those things in my life, I wanted LESS of those! And so more change was needed in my outlook and my focus. It is not always easy to take a good look at yourself, but it is absolutely worth it. Especially if it’s done through the looking glass of the grace and love of God. Keep your gaze fixed on the positive things about yourself, while you work on the not-so-great issues that will crop up. Find the people in your life that will love you for who you are and encourage you on your journey to a simple life. This blog series will help you take at least a few steps on your journey to a simple life. These may be your first steps or you may have already walked this road for a while. We’ll look at adding MORE of the positive, basic ingredients of a simple life, which will result in LESS of the negative clutter lying around. Food and drink is our first focus, since this provides the fuel for the journey. Then we’ll look at Overall Health (sleep, exercise, relaxation, and purpose). And we’ll wrap up this Year of Simple with a vision for how you want to use your time and resources.